Time for another edition of Weekly Eats! 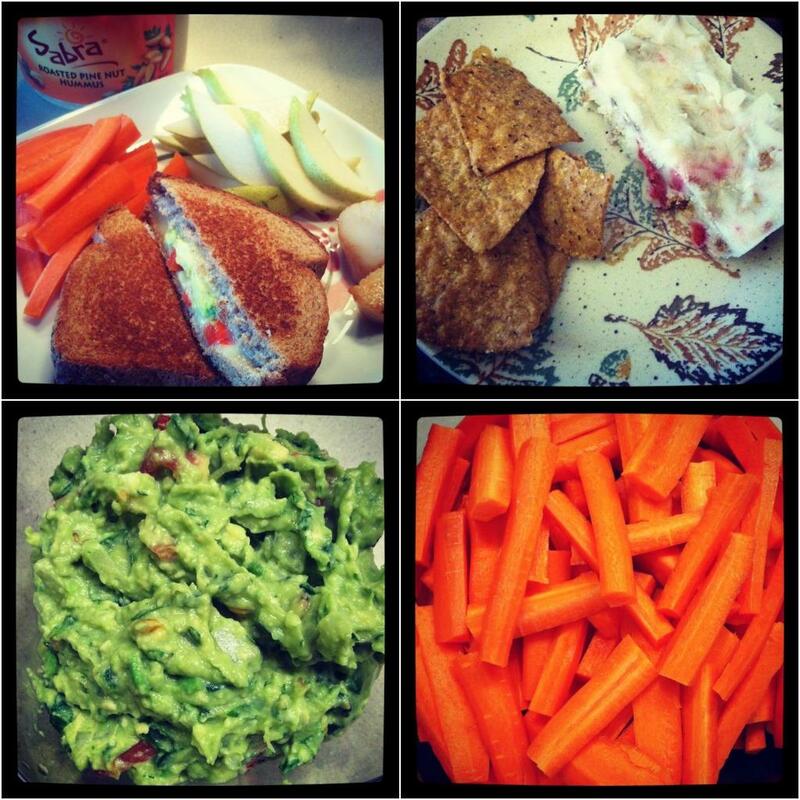 Lots of good things have been making their way into my tummy this past week! Let’s take a look, shall we? 1. Starbucks date to catchup with a good friend! 3 & 4. Black Eyed Pea Burgers: I used the recipe for my Sweet Potato Quinoa Black Bean Burgers w/ Cranberries and subbed black eyed peas for black beans and red peppers for cranberries. They were just ok. I was using up leftover black eyed peas but i really don’t like them very much. The original burger is much better! For the Enchiladas: I just kinda threw it together but here’s my best guess: 1 c quinoa, 2 cups cooked black beans, 1 red pepper- diced, 1/2 c onion- diced, 1 can low sodium cream of mushroom soup, a handful of shredded mexican cheese, 1 tsp cumin, 1 tsp paprika, 1/2- 1 tsp cayenne pepper. saute the peppers and onions for a few minutes until soft. put them in a bowl, add all the other ingredients and mix well. grease a pan and pour a little enchilada sauce on the bottom of the pan. spoon the bean/quinoa mixture into 4 or 5 whole wheat tortillas and place seam side down in the pan. pour a little enchilada sauce on top and spread with a brush so the tops of all the tortillas are covered. sprinkle with cheese, cover with foil and bake for 30 minutes at 375 degrees. 4. Salmon salad with quinoa, peppers, onions, tomato, hard boiled egg and guac! We thought about going out for dinner because we were SO hungry. 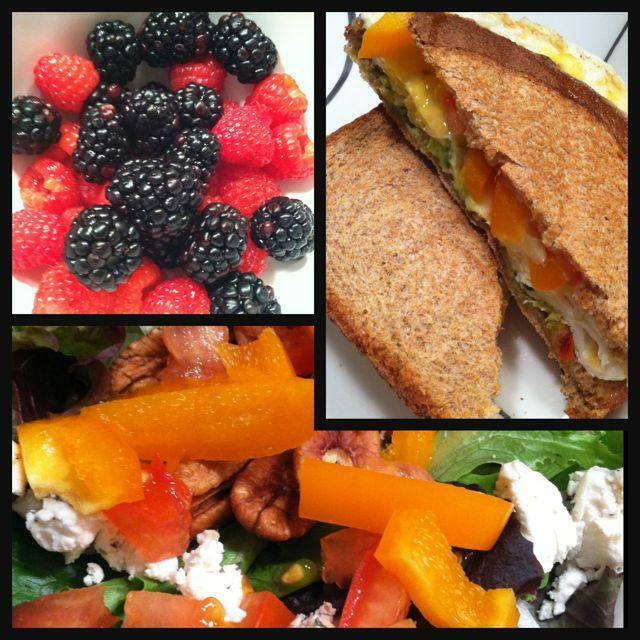 Instead we came home & made this dinner in under 15 min- panini with two eggs, homemade guac, peppers, onion, tomato & cheese on whole wheat bread, plus fresh fruit and a big salad! Saved us money and was easy, healthy and delicious! 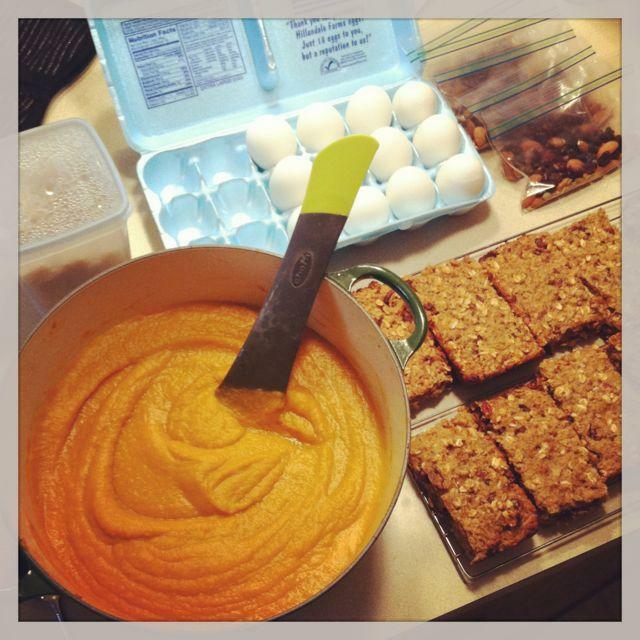 Weekend food prep for my first week back at my internship: quinoa breakfast bars for hubby’s breakfast, sweet potato soup for lunch, quinoa for dinner, lots of hard boiled eggs, homemade trailmix for snacking…plus I made a batch of Perfectly Roasted Chickpeas. Plus there’s always time for treats! 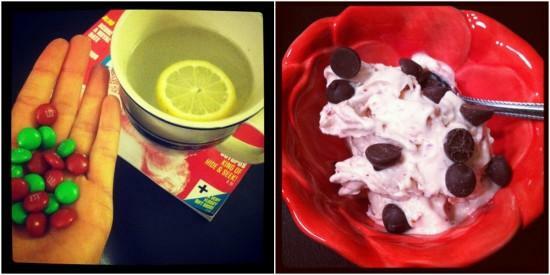 M&m’s with lemon ginger water and some cranberry banana “fro-yo” with dark chocolate chips! 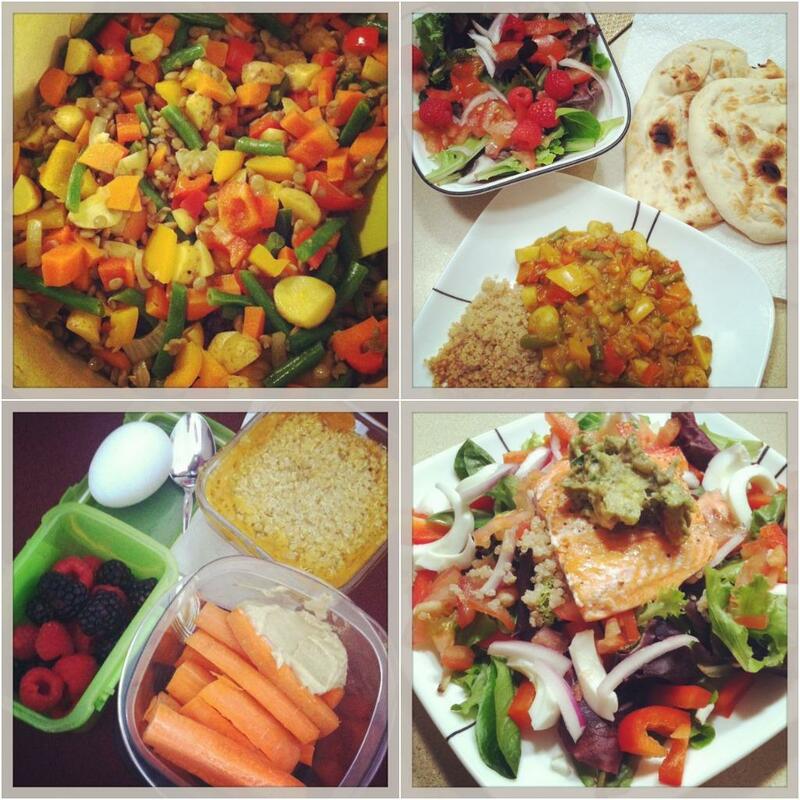 What have you been eating lately? 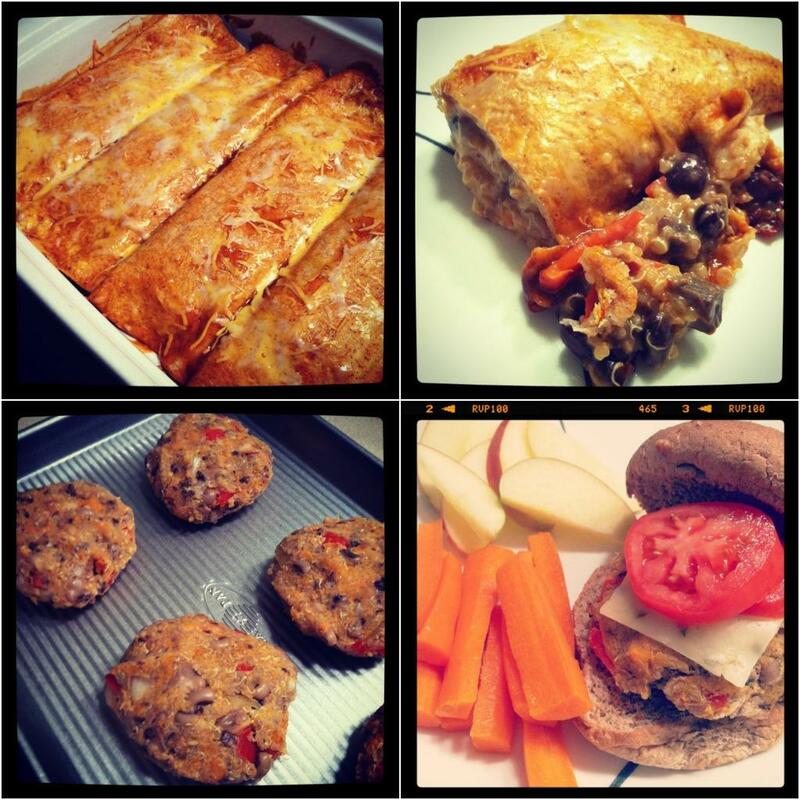 Try any fun new recipes?! I love the “fish bowls.” Definitely not what we called fish bowls in college. LOL! hahaha i know right?! oh how things have changed! I can’t get enough of salmon and eggs this past week! And guacamole! Everything looks delicious as usual. salmon and eggs just go together so well! I was glad to see that you’re a fan of the infamous “bowl” dinner too 🙂 For some reason, when a bunch of mismash is in a bowl together, everything just tastes better! 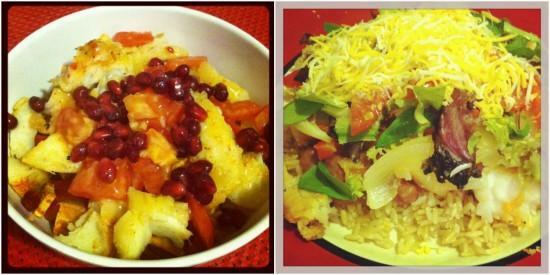 dinner bowls are the way to go! I love the fancy grilled cheese idea – I rarely make grilled cheese because itz so boring. I should try adding veggies like you did! yes! definitely add other stuff! You know I love your enchiladas, can’t wait to try these! looove putting avocado in grilled cheese! LOVE sweet potato soup. Looks like a well-rounded week. I always love taking a look at your eats. They are always so diverse! i was craving them! love enchiladas! I’m making a really big effort to clean out my fridge and pantry. I’ve been doing a good job and have really been enjoying 2 random eats: fig butter and cauliflower rice. oooh cauliflower rice is on my list! I’m loving all the eats. 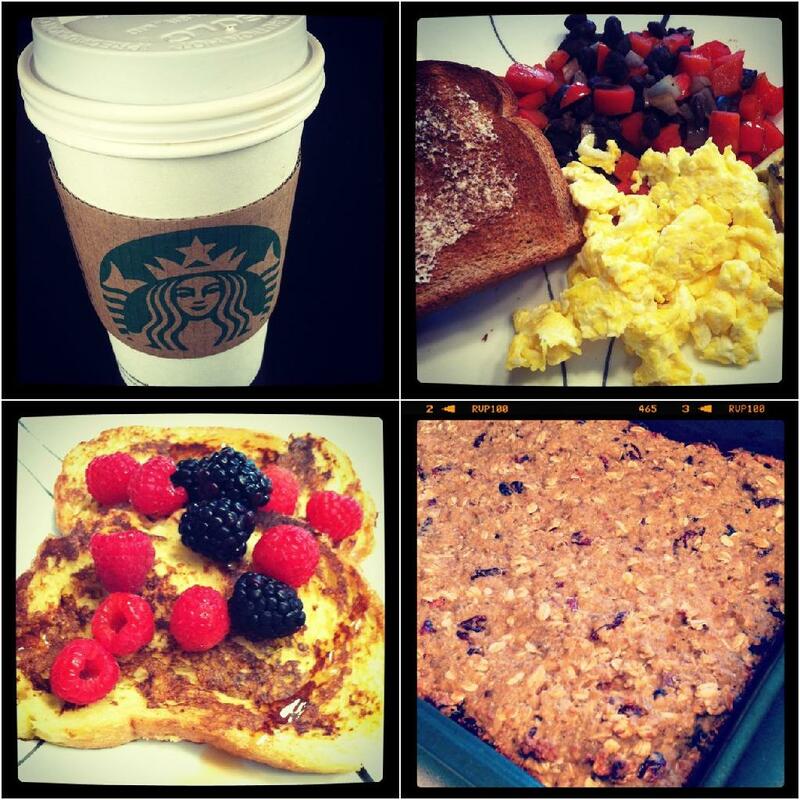 I make a similar quinoa granola bar recipe! What type of cheese did you use for the grilled cheese? It looks really good and unique. Those fish bowls look amazing…what a great idea! I’ve been eating a lot of eggs recently (my go to food), since we got a few dozen from our local farm.